BUFFALO, N.Y. (AP) -The Buffalo Sabres spoiled two former teammates' homecoming, and picked up another two points in the standings. Jochen Hecht snapped a late third-period tie, and Ryan Miller made 20 saves in his seventh consecutive start to help the Sabres beat the Philadelphia Flyers 3-2 on Friday night in the first game of a home-and-home series. The win ruined the return to Buffalo for Daniel Briere, the former Sabres star who signed an eight-year, $52 million contract with the Flyers during the offseason. Briere failed to pick up a point and finished with a minus-2 rating. Flyers goalie Martin Biron also made his first appearance in Buffalo since the Sabres traded him to Philadelphia in February. But more importantly for the Sabres, they've matched a season high with their five-game winning streak and have won 12 of their last 16 after being just points away from the Eastern Conference basement two weeks ago. "We didn't focus on those two players, we focused on the team," Hecht said. "We came in to have a good game. We're on a winning streak now and we've put together some games where we've found a way to win." Hecht beat Biron with a backhander off a rebound with 2:51 remaining. "It was a deflection that went off my shoulder," Biron said. "They got to it first and I think it went off a defenseman's skate." Drew Stafford and Ales Kotalik also scored for the Sabres, who beat Philadelphia for the ninth time in the last 11 games played in Buffalo. "We're gaining confidence," Miller said. "Our puck possession time has been a lot better in the last 12 games or so. We're playing smarter, and that gives us the puck more." Jeff Carter and Joffrey Lupul scored for the Flyers. Philadelphia has lost five straight, its longest losing streak of the season. It also was the fourth consecutive game they've squandered a lead, but the first time this season they lost when leading after two periods. "We're a young team," Briere said. "We're still in the stages of trying to learn how to stay patient and find ways to win." There were plenty of "Welcome Back Danny" signs scattered throughout the crowd, but perhaps the best sign was held up by three young girls and said, "All I want for Christmas is Briere in a Sabres jersey." The good feelings, however, ended once the game began, with the crowd booing Briere every time he touched the puck. "It was what I expected," Briere said. The Sabres opened the scoring on Stafford's eighth of the season. Stafford's backhander off a rebound bounced off Biron and barely crossed the goal line with 2:05 left in the first period. The goal was upheld after a long review. Philadelphia tied it 2:13 into the second on Carter's 10th of the season. With the teams playing four-aside, Carter slipped a wrist shot through Miller's legs after he had a partial breakaway off a nice feed from Scott Hartnell. The Flyers pushed their edge to 2-1 45 seconds later on Lupul's 13th goal. On the power play, Lupul picked up a loose puck in the slot and lifted it over Miller. Buffalo tied it on the power play 4:30 into the third on Kotalik's 10th goal. Biron finished with 32 saves. Notes: The teams will play again in Philadelphia on Saturday night. ... Sabres C Tim Connolly is sick and didn't play. ... Philadelphia D Randy Jones missed the third period with a lower body injury. ... Sabres backup goalie Jocelyn Thibault broke his nose while sitting on the bench, but coach Lindy Ruff believes Thibault will be available for Saturday's game. ... Flyers D Jim Vandermeer made his Philadelphia debut after being acquired from Chicago on Tuesday in a trade involving LW Ben Eager. 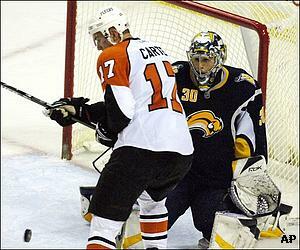 ... Biron was Buffalo's first-round pick in 1995.